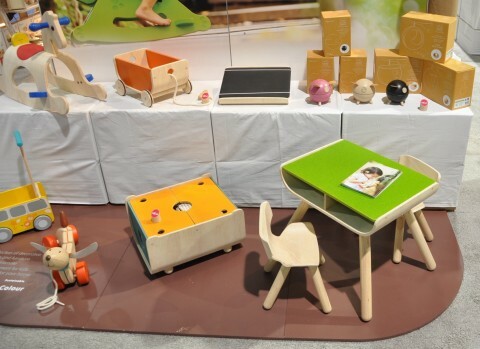 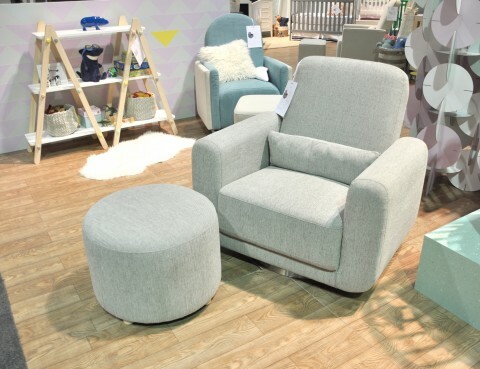 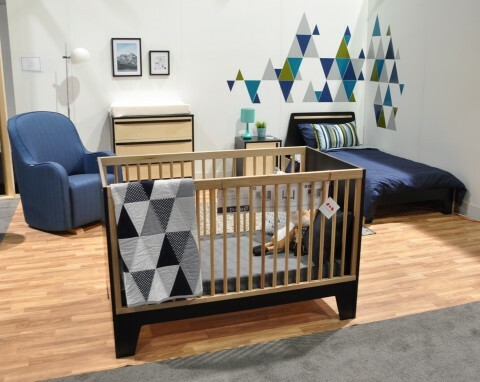 As we wrap up our ABC Kids Expo coverage, there are a few new modern furniture collections that I want to be sure that you see. 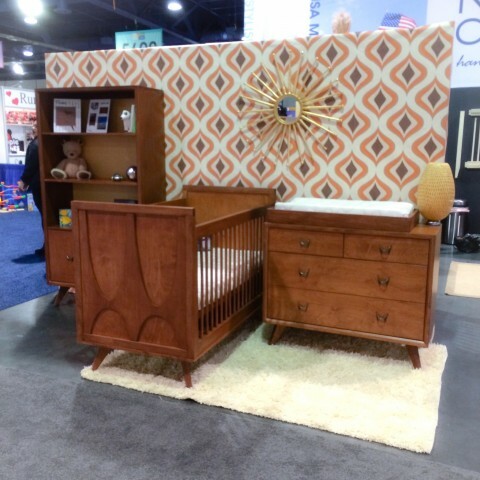 From Newport Cottages, if you really want to go full on with the Mid-Century modern details, the Skylar collection is your dream come true. 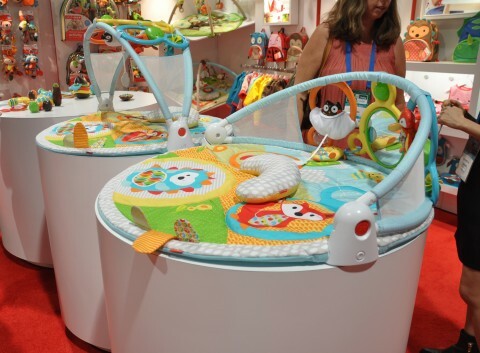 Finally, another Spanish nursery brand was testing the US waters at ABC Kids. 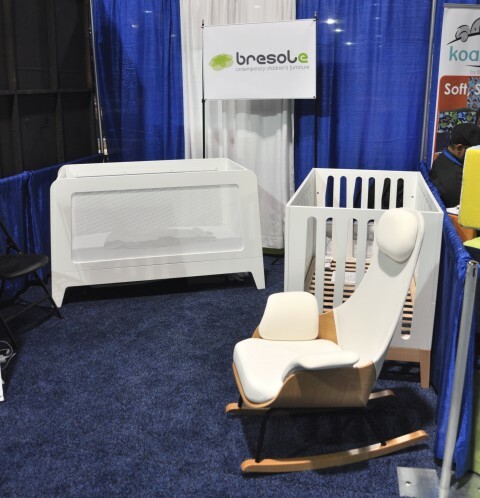 I loved both cribs from Bresole, the Nubol and the Juvi and the rocker was a prototype they’re working on, so let’s keep our fingers crossed for that beauty. 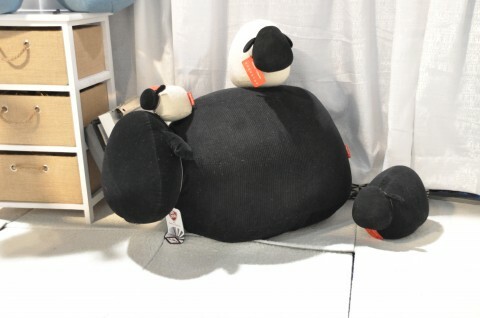 As is, it was a little small. 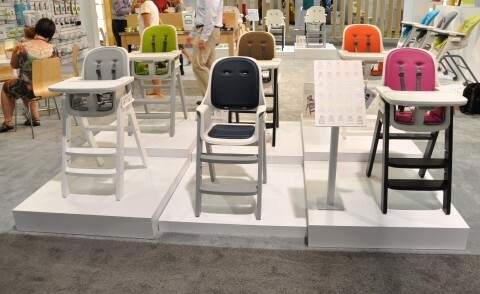 I’m 5′ 5″ and the seat seemed a little petite for me. 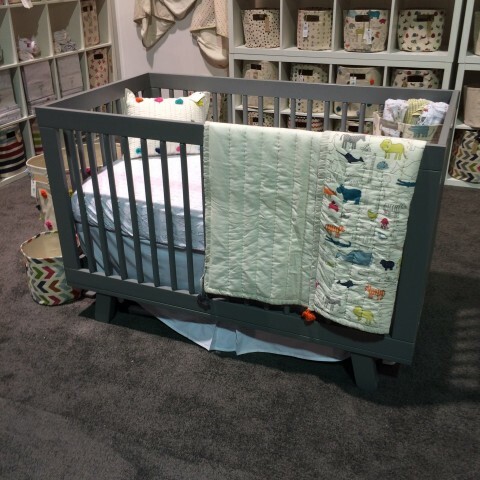 Aren’t you excited about all the nursery possibilities?! 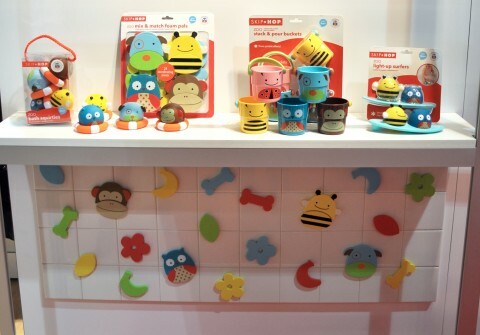 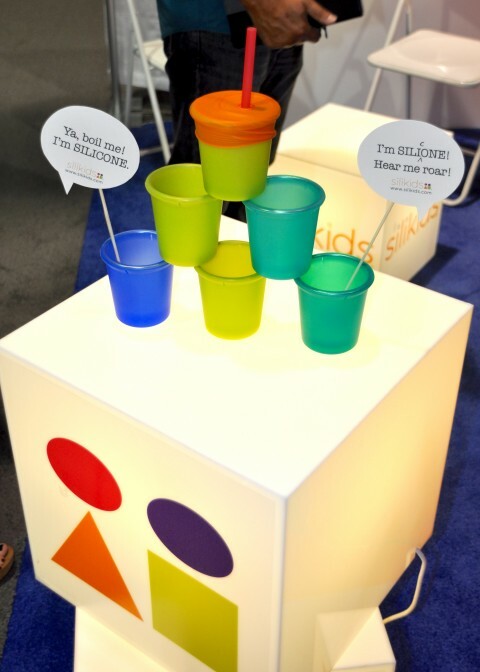 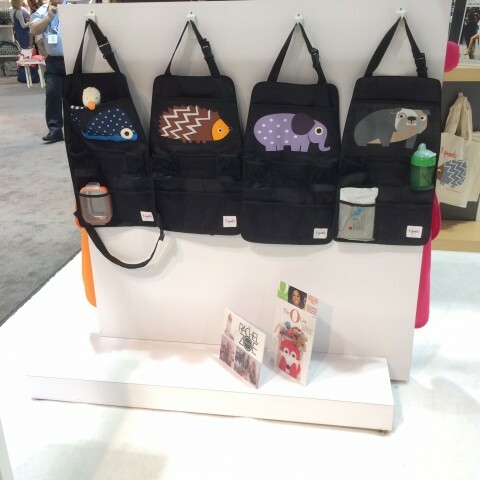 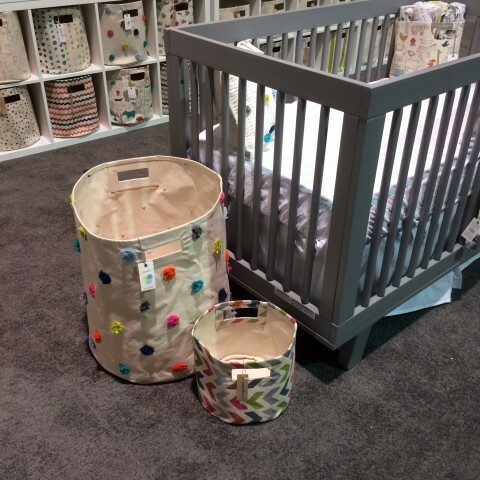 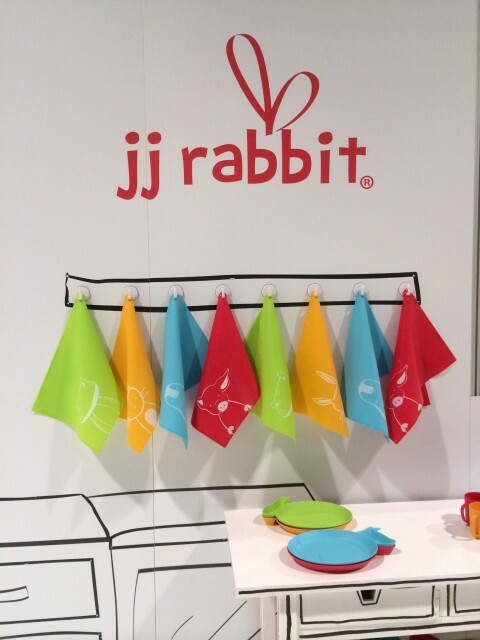 My favorite new brand discovery from the ABC Kids Expo 2015 was Monica Richards. 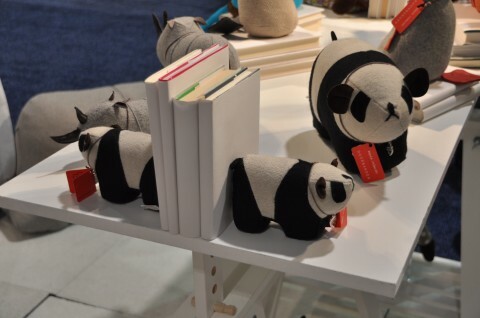 as well as book ends and door stops. 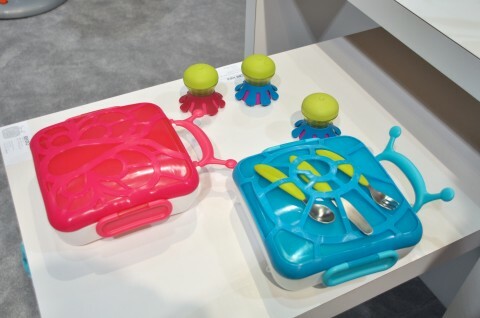 as well as back seat organizers for the car! 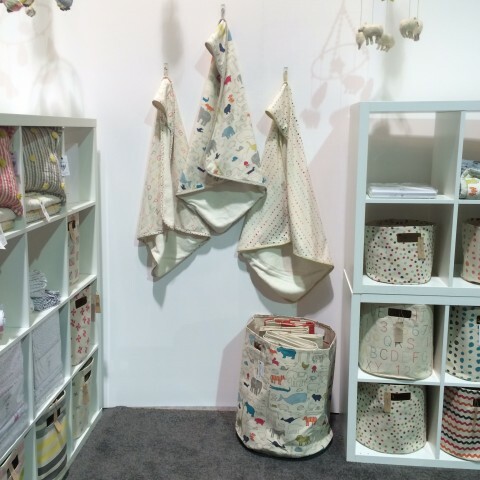 The new patterns from Petit Pehr really caught my eye. 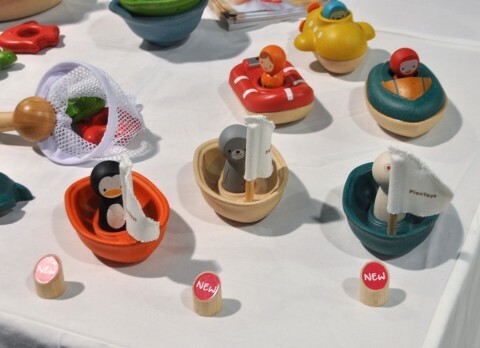 I love the Noah’s Ark design as well as the Pom Poms. 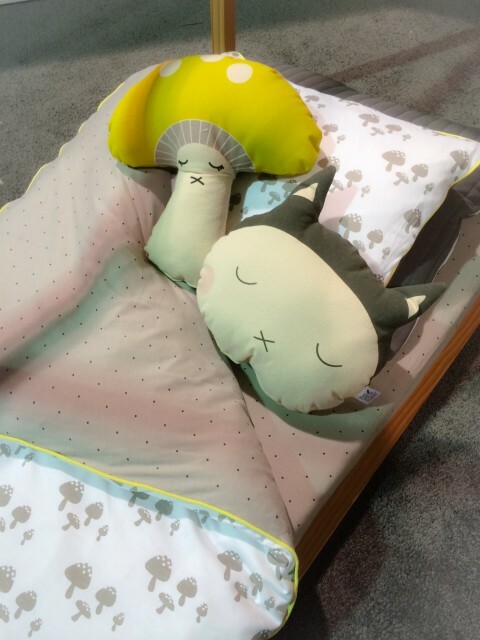 It was great seeing our friends from Kid Wild Collective, and I love their new plush pillows like the mushroom and Mr. Cat! 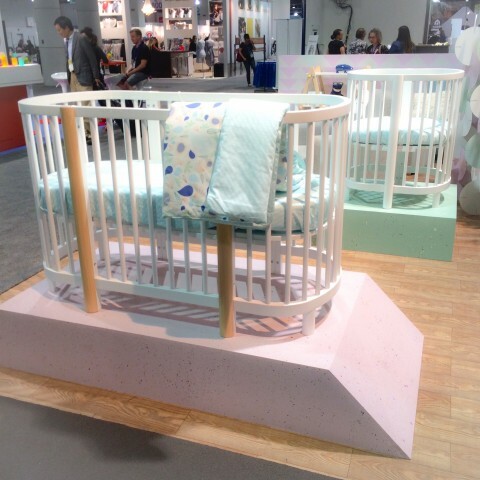 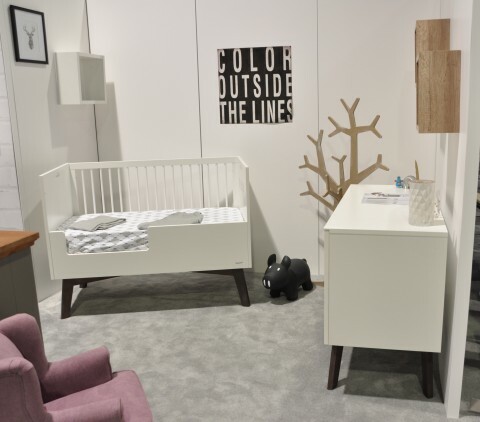 Babyletto is one of the best modern brands from MDB and they always have new nursery offerings to look forward to. 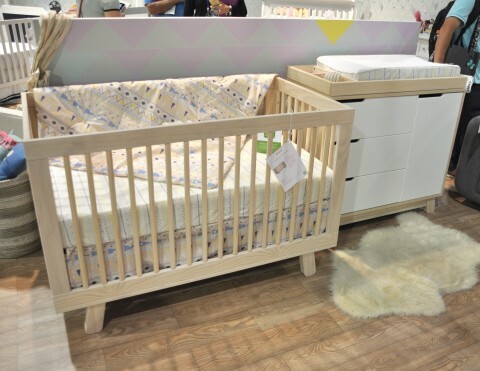 The first attention-getter is the new Hula Crib. 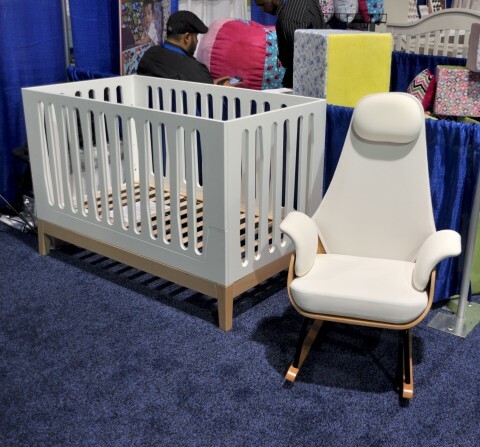 This, like other oval cribs, converts from a bassinet to crib. 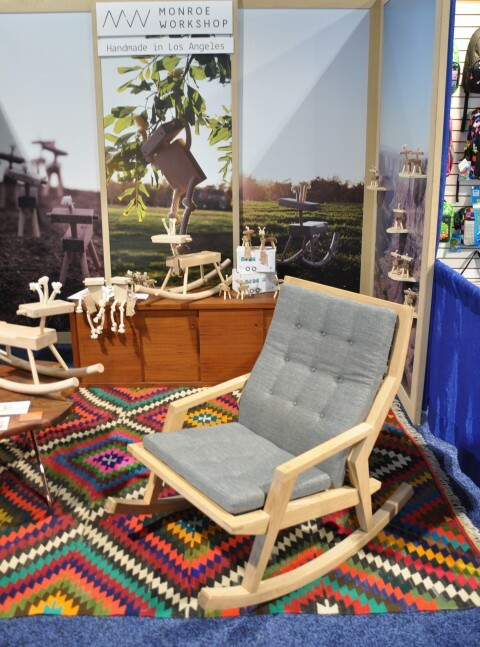 The Tuba Glider lives up to its namesake. 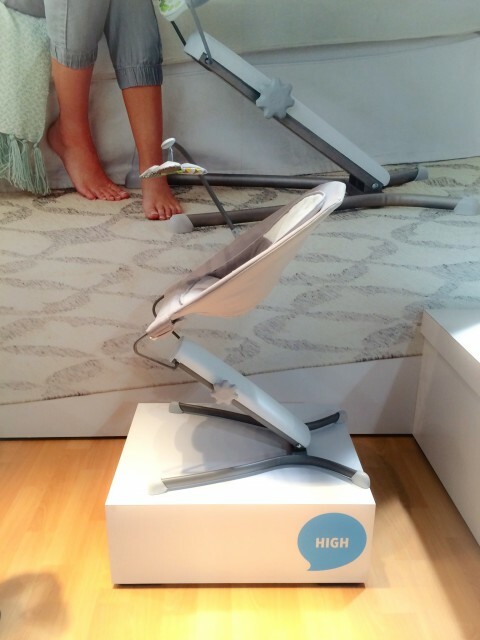 This is a hefty wide glider without a hefty price. 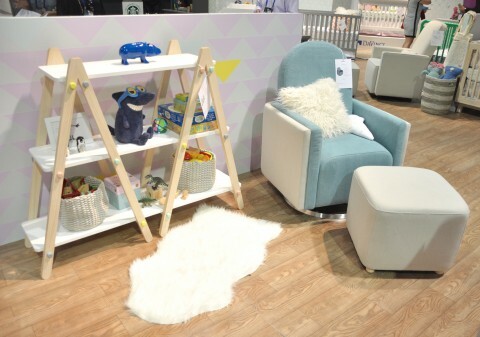 The Macaron Glider and Dottie Bookshelf are two unique nursery pieces that will help make Babyletto one of the most fun and playful nursery brands. 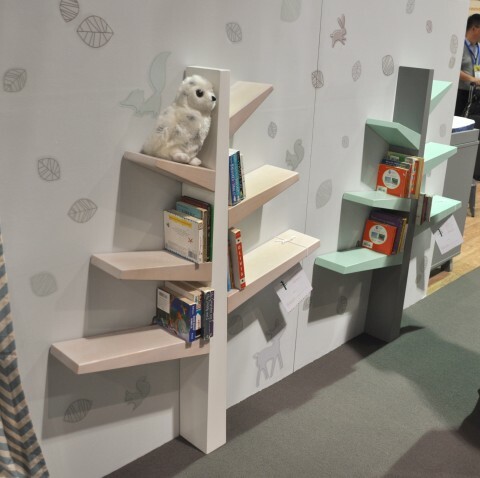 There’s also the new Pogo bookshelf that unfortunately I failed to snap a photo of. 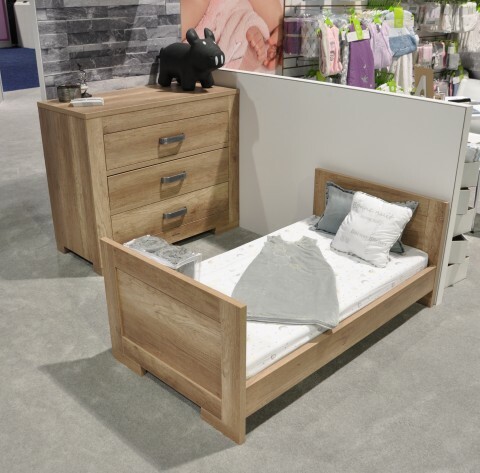 I’m looking forward to the Hudson Collection in this beautiful new Washed Natural finish. 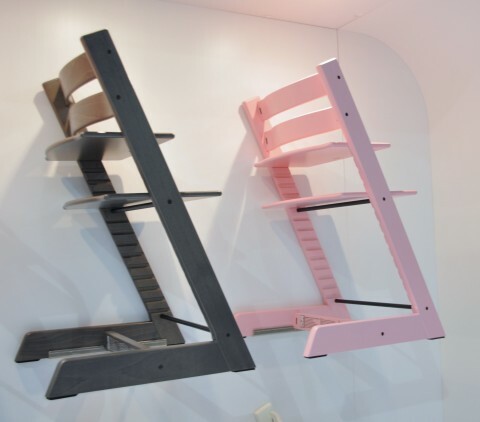 Babyletto is also considering new colors for the Spruce Tree Bookcase. 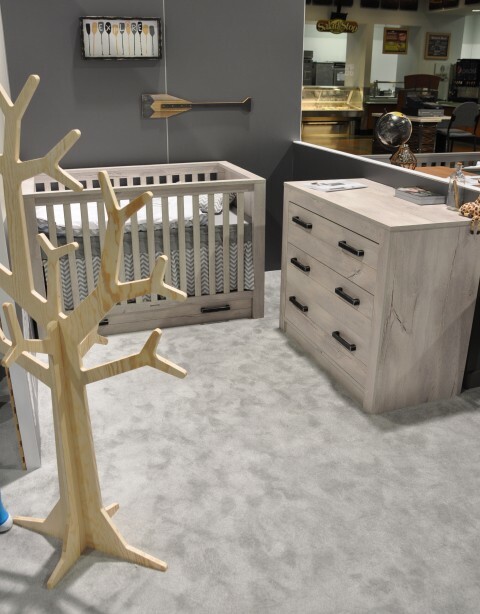 It’s currently available in Green and White, but Gray will soon be added and maybe some of these two tone trees. 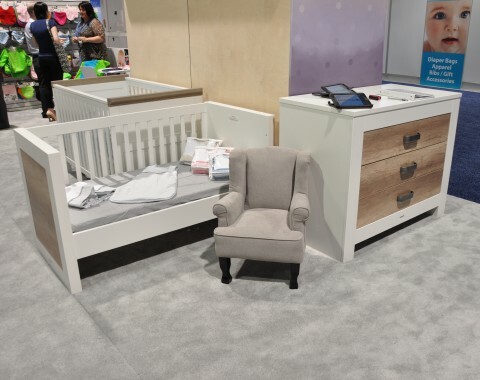 What piece are you looking forward to in your Babyletto nursery? 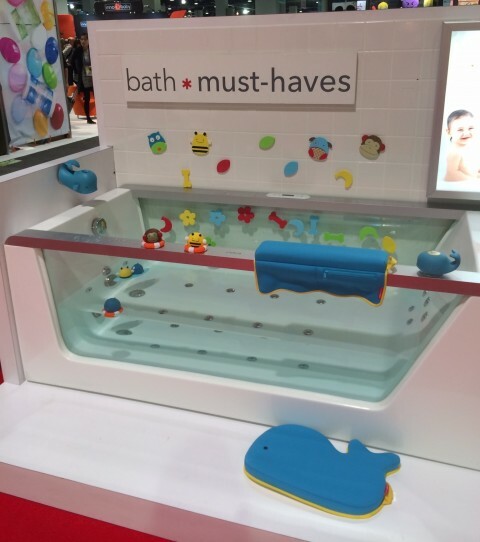 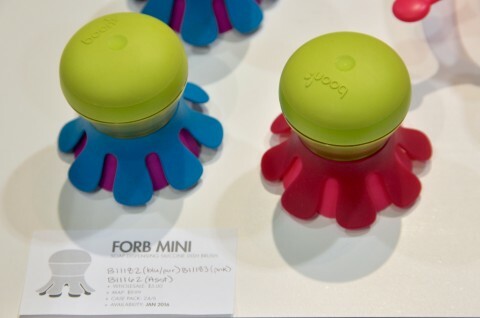 When I’m looking for a break from all the baby gear and strollers at the ABC Kids Expo, I go searching for a little fun in the form of toys. 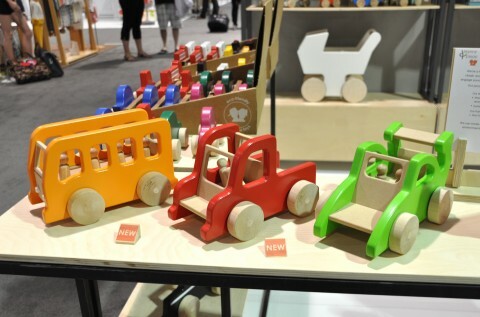 First I was excited to come across the new line of toys from Monroe Workshop. 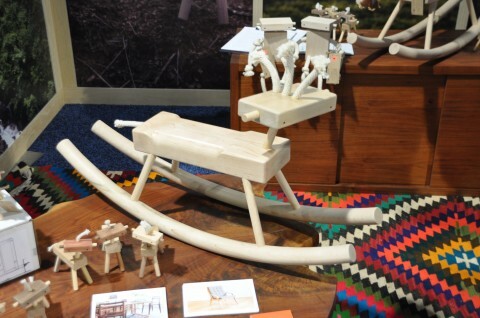 Their collection includes mini robot horses, a robot monkey and this Robot Monkey Rocking Horse. 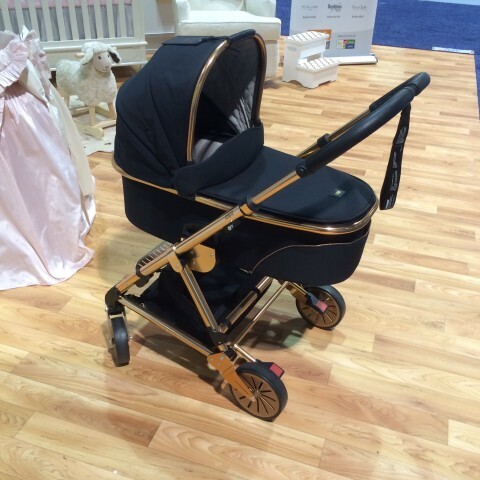 You’ll also want to take note of their incredible Haverhill Rocker. 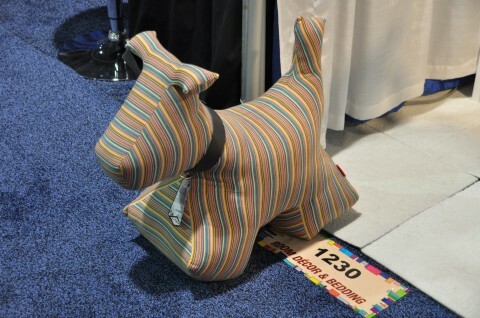 I would have loved to bring one of these home with me! 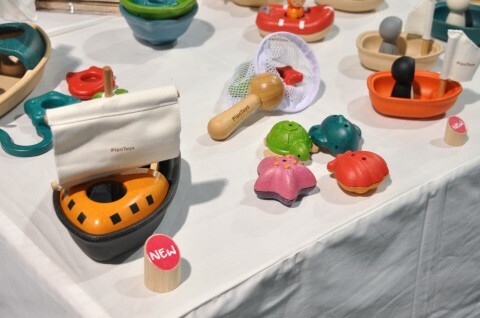 Manny & Simon always has something new to show and this year it was these vehicles with peg people. 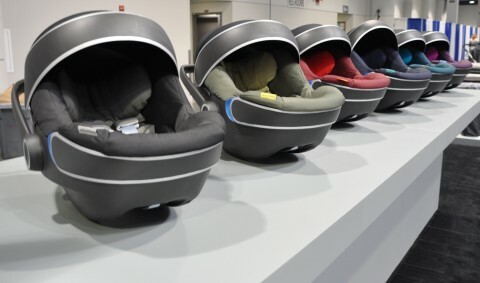 They’ve had vehicles before, but with the people, there’s an added level of play value. 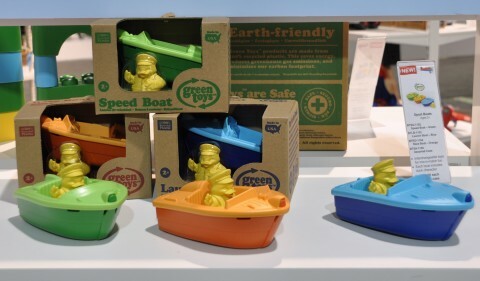 Green Toys is also featuring more vehicles with figures including these Sport Boats and the Dumper, Mixer and Scooper. 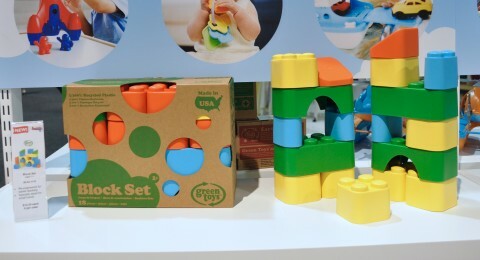 They’re also bringing back their stacking block set but with a new color combination. 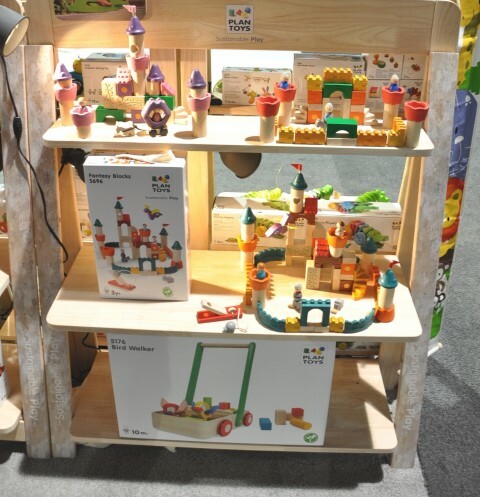 One of my favorite modern toy brands is Plan Toys and they always have lots of new toys on display. 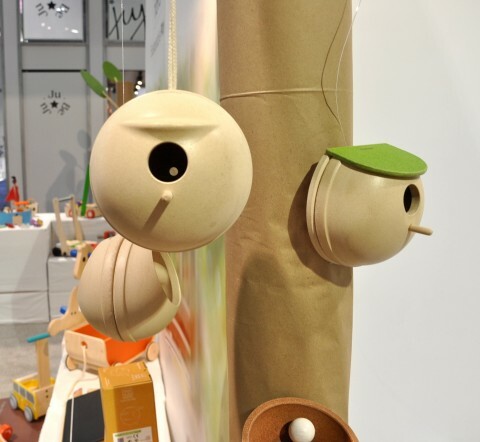 bird houses and bird feeders. 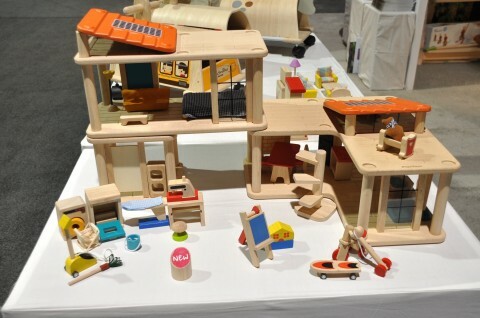 And their newest dollhouse is this Creative Play House. 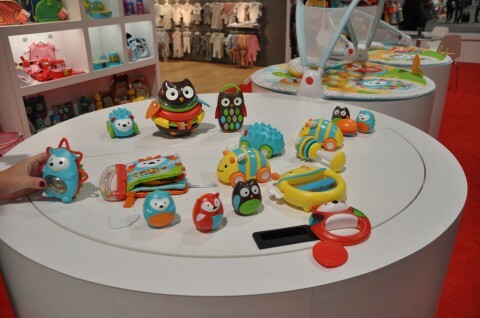 Look for these new toys for your holiday gift giving! 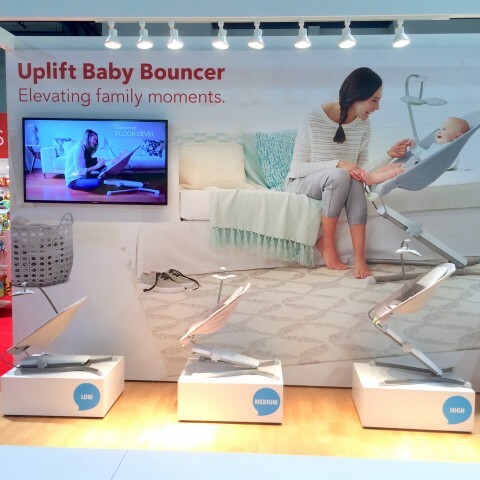 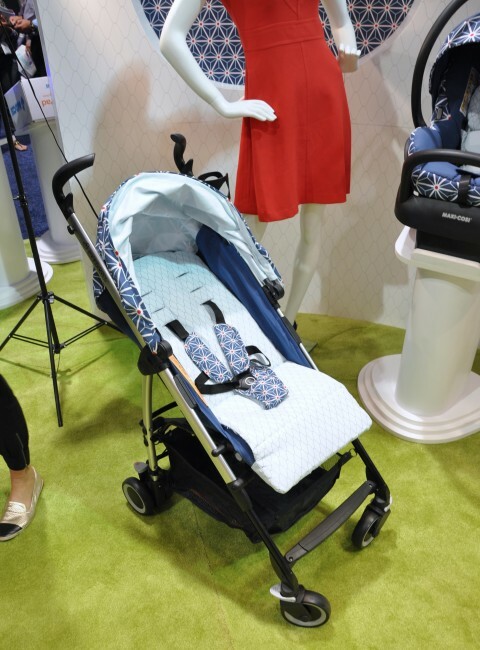 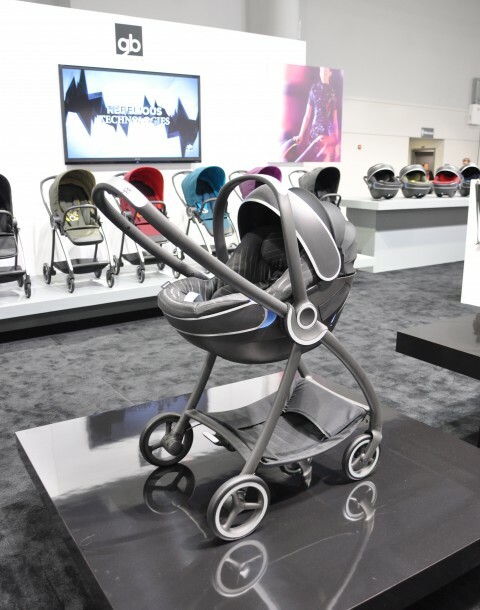 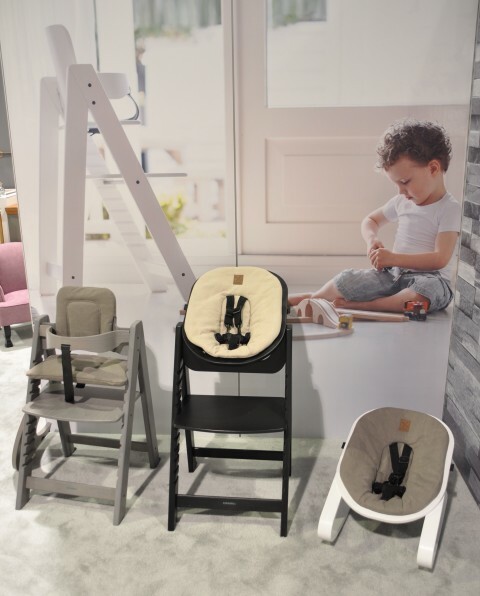 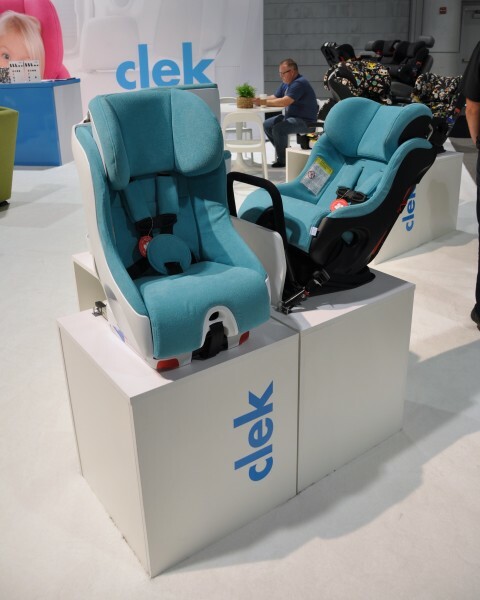 The number and variety of stroller brands, models and features presented on the floor of the ABC Kids Expo is always overwhelming, but there are so many new things that you’re going to love in the world of modern strollers for 2015 and 2016. 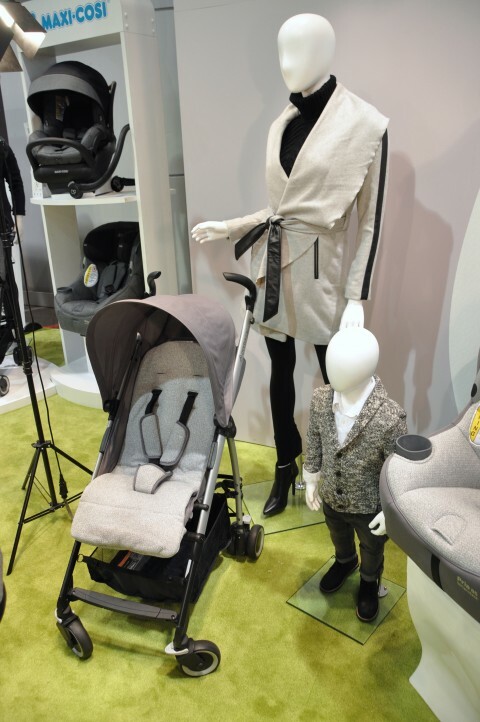 I was surprised when I saw OXO had come out with a stroller, but the parents at OXO strive to solve the most annoying parenting problems, so I knew this was worth taking a look at. 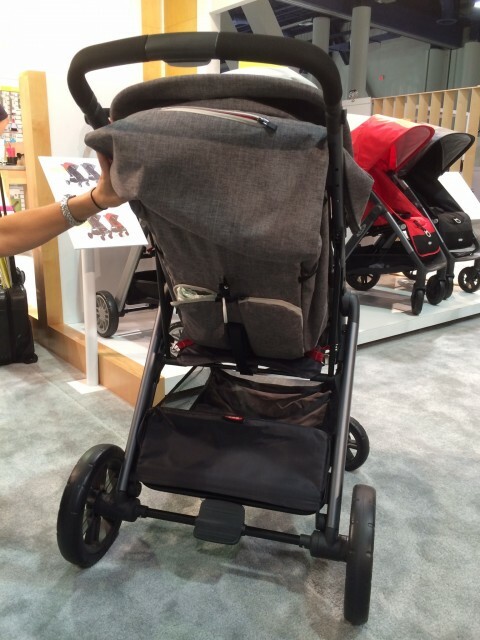 I liked how even folded and standing up vertically, the handle doesn’t touch the ground, and true to its name, the Cubby has plenty of nifty pockets that make it almost like a diaper bag on wheels. 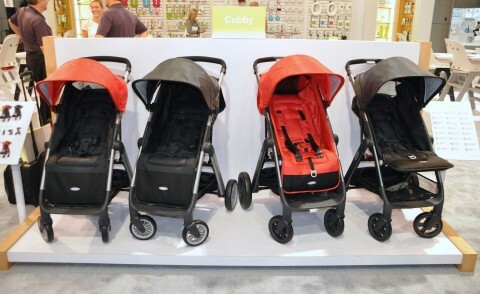 There are two versions of this stroller– the Cubby ($300) and Cubby Plus ($400). 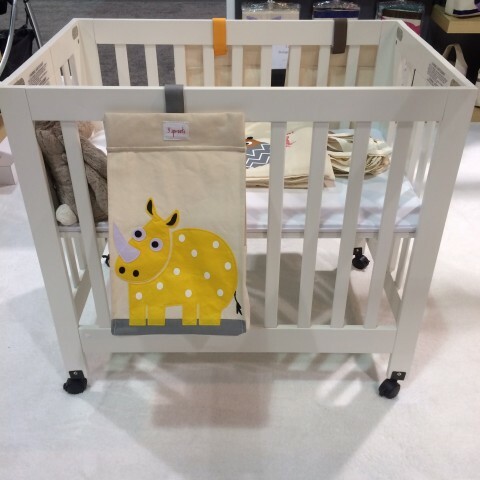 Coming in 2016. 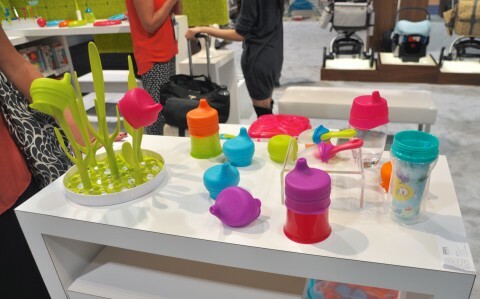 I was really excited to see this colorful booth on the show floor. 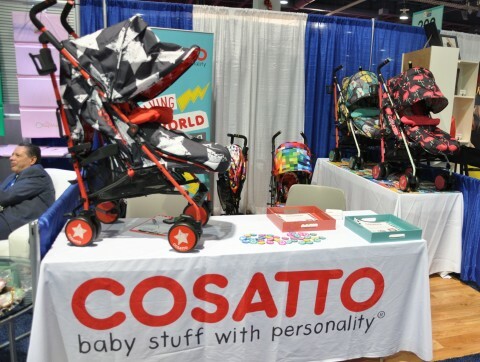 Did you know that you can find Cosatto strollers in the US now? 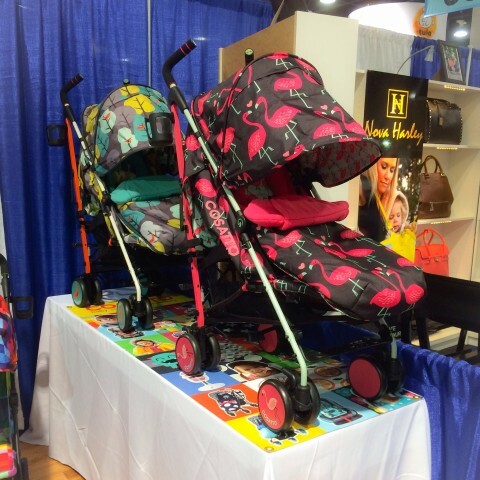 You can find the Supa Stroller in lots of colorful patterns like Hipstar and my favorite– Flamingo Fling! 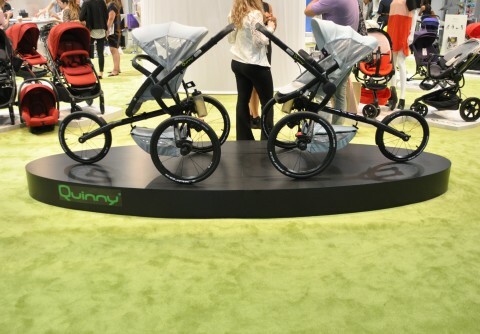 There was lots of excitement at Quinny, and it wasn’t just about the fancy new jogging stroller (coming next spring). 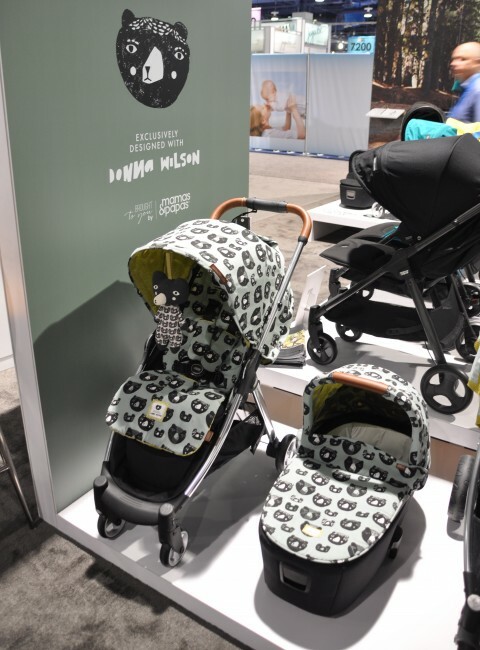 Quinny and Maxi-Cosi are making strides to have the most fashionable strollers and car seats, and their latest collaboration is with the fashionable Rachel Zoe. 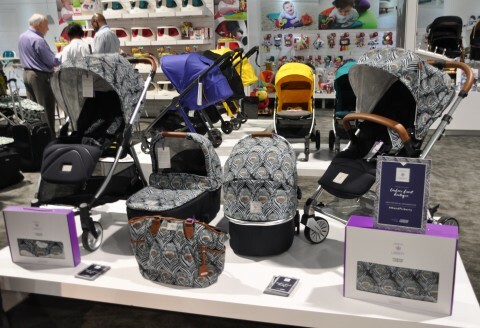 Her collection will include a Quinny Moodd as well as Pria 85 and Mico Max 30 car seats. 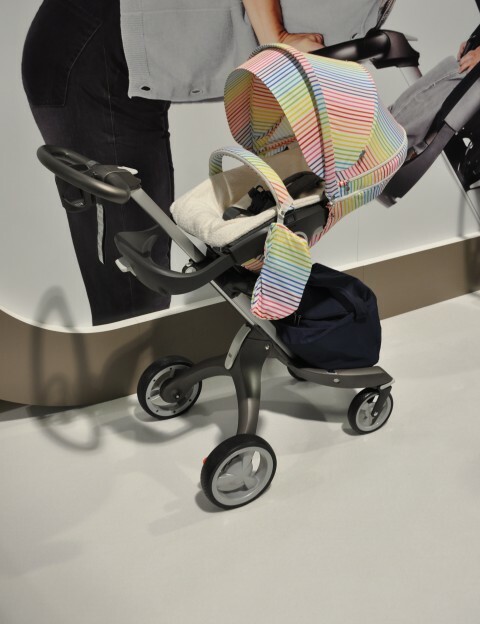 The Watercolor Maxi-Cosi should be available to accompany you on winter travel to tropical destinations. 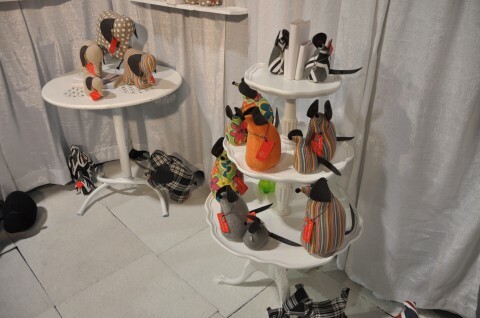 For something a little more subtle, but extremely elegant, consider the Sweater Knit collection. 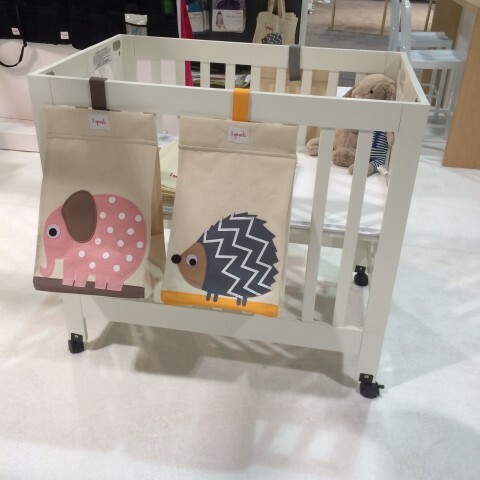 This collection should ship any day now to keep your baby looking cozy this fall. 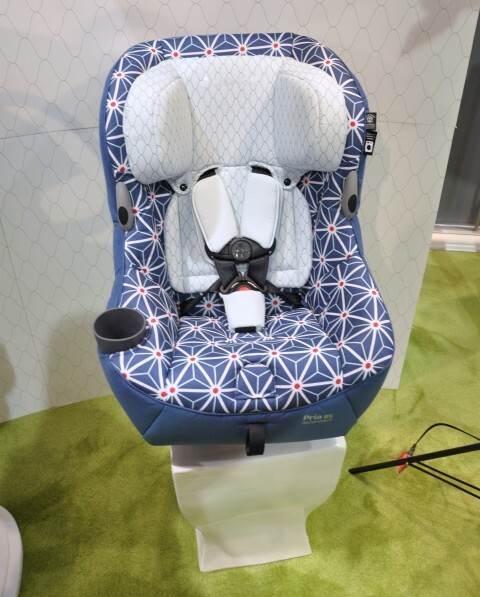 Quinny’s Bold Block Moodd and Buzz with matching Maxi-Cosi car seats are fantastically fashion forward and come in this bold red combo or a more tonal cream and gray . 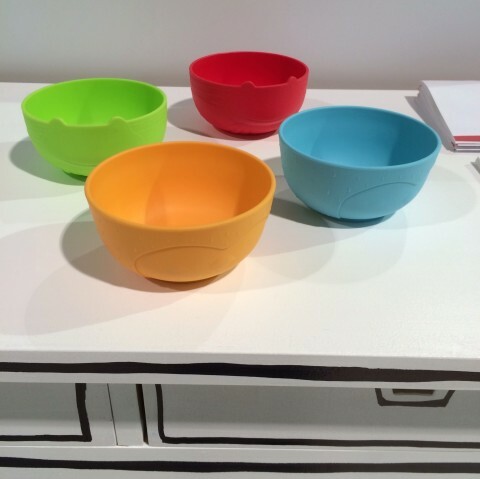 If you still haven’t found the special edition beauty you love, how about Star by Edward van Vliet? 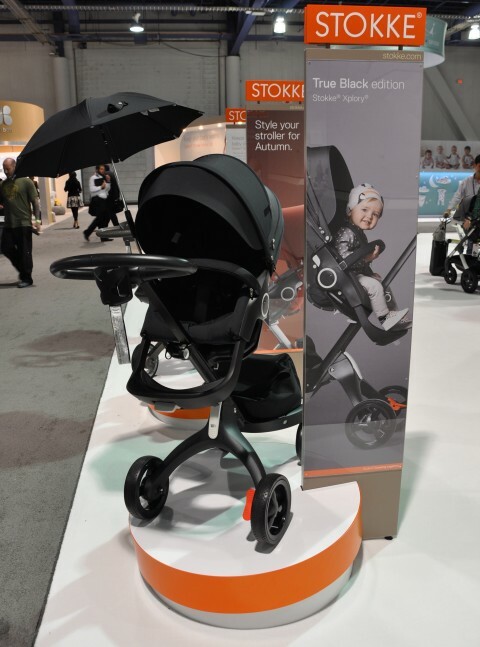 No excuse for plain boring strollers any more! 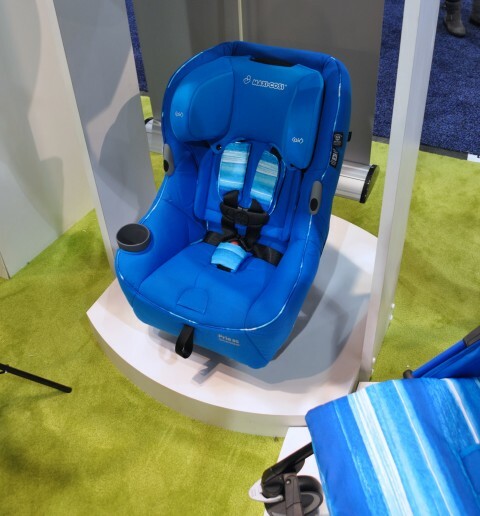 … but if that’s too much, the Capri blue color is a beautiful new shade. 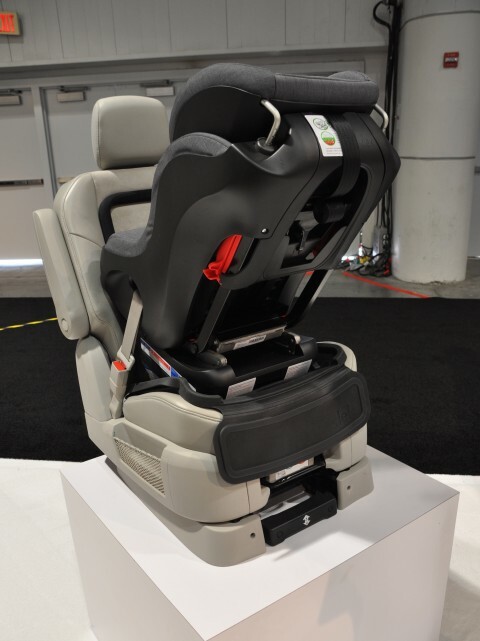 Also worthy of mention is their seat protector accessory. 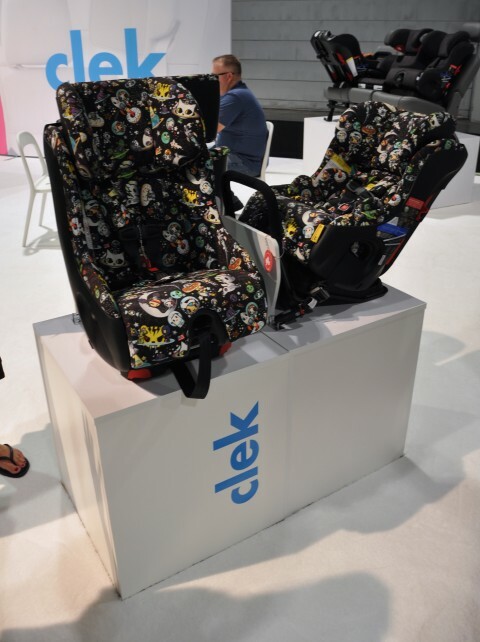 Might as well get the Clek one when you buy your seat. 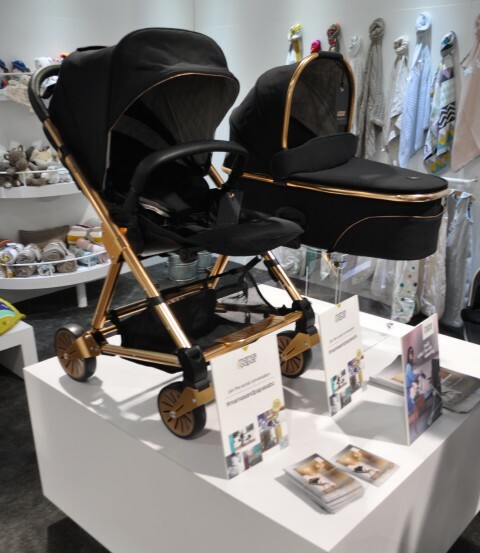 Even Mountain Buggy is embracing the fashion stroller trend and introduced the Cosmopolitan Luxury Geo Stroller. 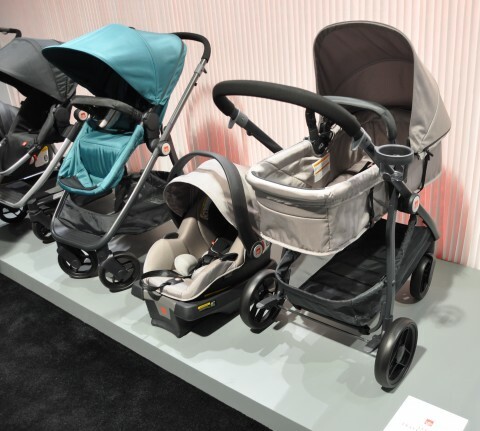 Mamas & Papas always has beautiful strollers but this year they really outdid themselves. 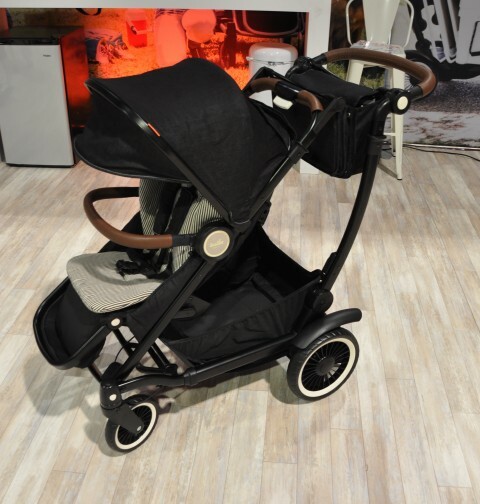 The Rose gold frame on the Urbo2 looks really luxurious. 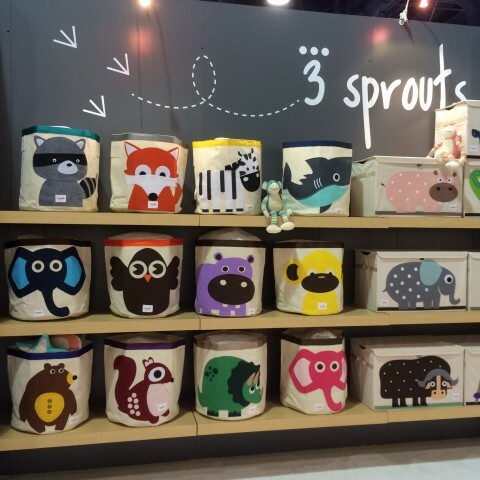 The new Donna Wilson bear print is ridiculously cute. 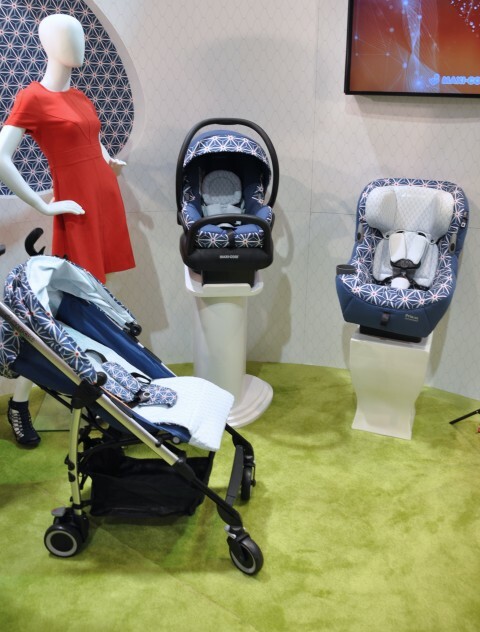 And finally, the peacock feather pattern of the new Liberty collaboration is one of the most stunning things you’ve ever seen on a stroller. 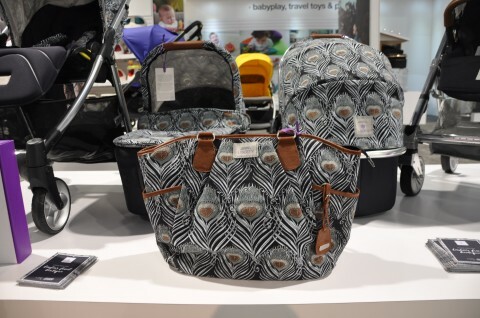 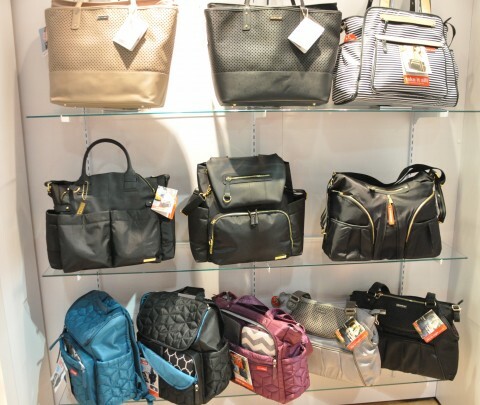 If you’re unlucky enough not to need another stroller, at least grab the diaper bag! 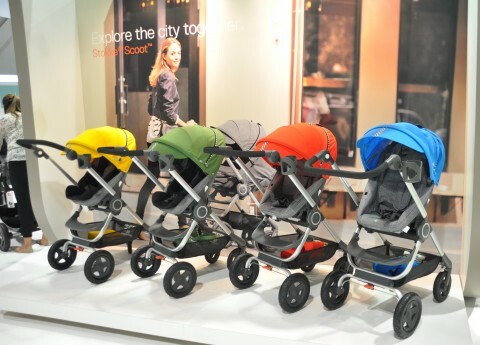 Stokke’s strollers are keeping up with the fun fashion trends and there are more combinations and colors to choose from than ever. 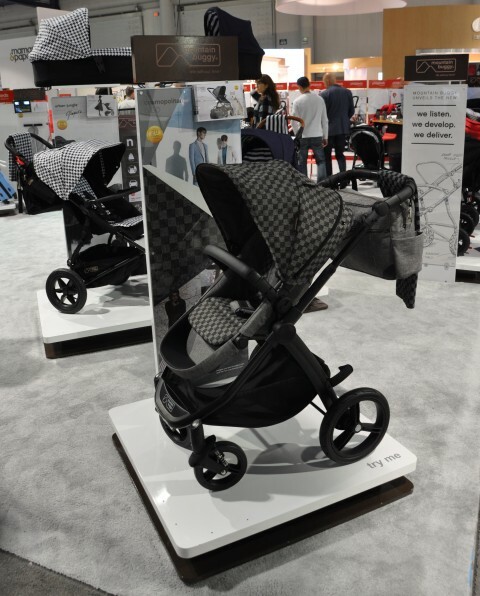 One of the most talked about strollers in Vegas this year was the Entourage stroller from Austlen Baby Co. 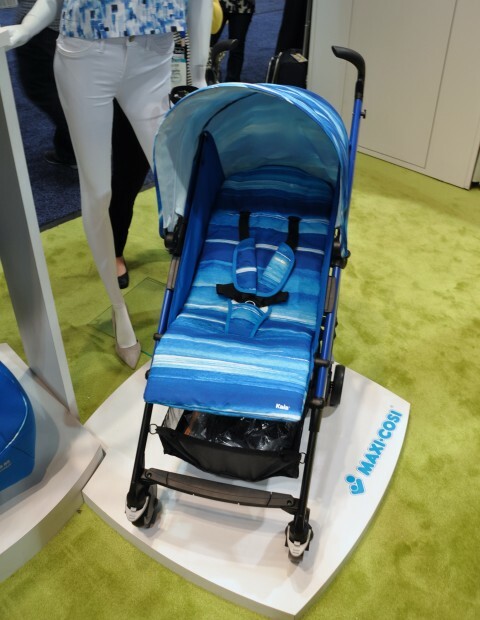 The winner of the 2015 Best In Show in the JPMA Innovation Awards, this revolutionary stroller has all the storage you could ever want from a stroller and is super versatile with over 30 different configurations. 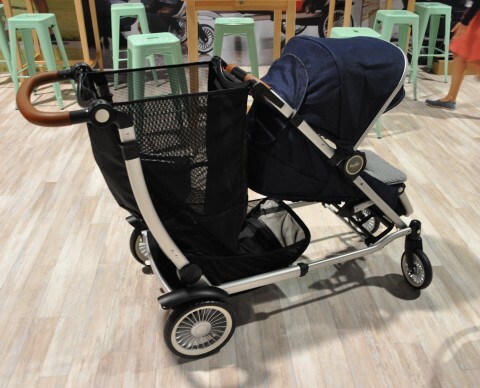 It’s a single stroller, a double, a twin, a travel, a shopping cart… you really need to take a look at this thing. 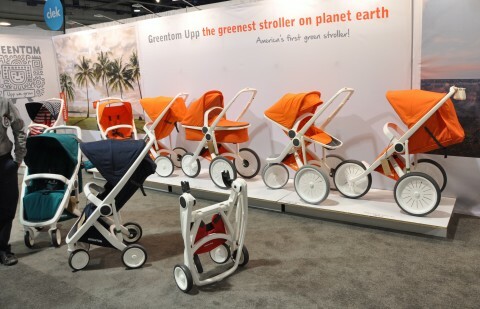 Another attention getting new (to the US at least) brand is Greentom. 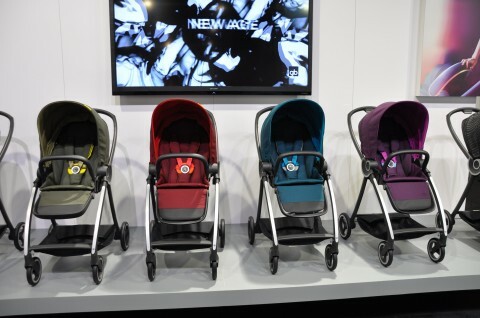 These strollers are very lightweight and made of recycled plastic! 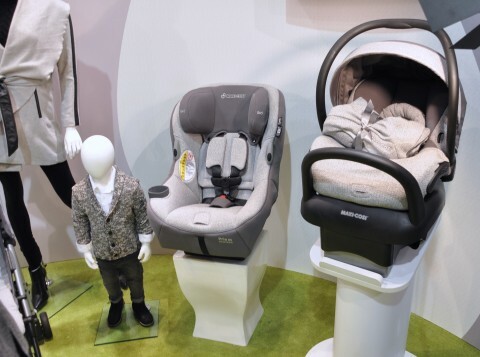 Finally, I really enjoyed getting to learn about gb child and learning about their diverse lines of strollers, car seats and travel systems. 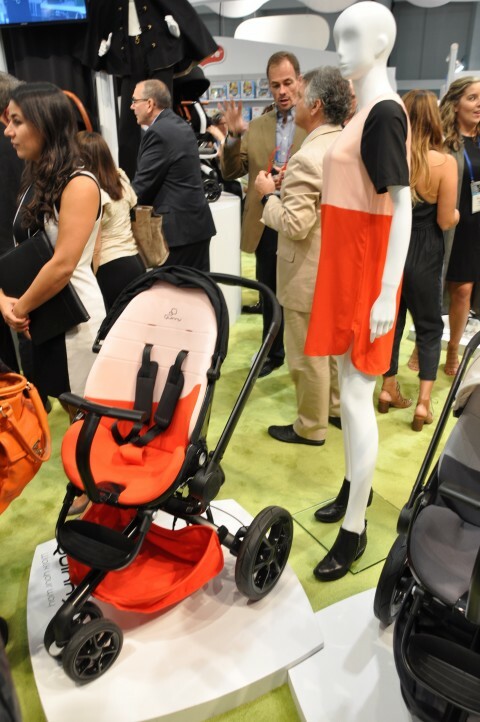 By far the most stunning was their Pockit, which holds the record as the world’s smallest folding stroller. 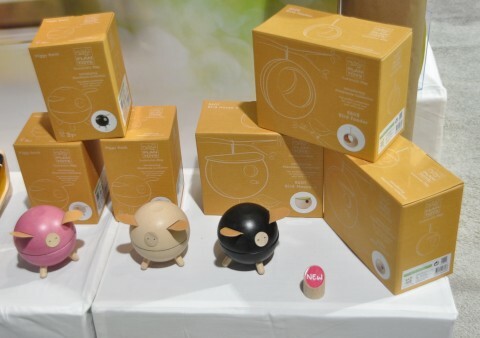 It’s really impressive and I hope I get a chance to play with one! 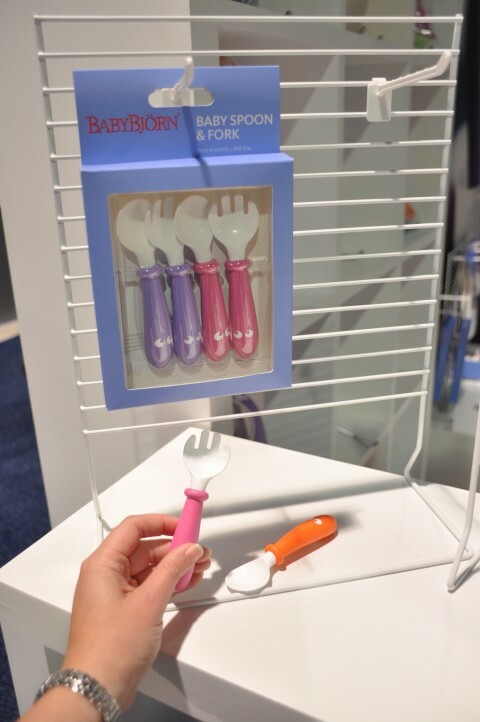 Check out my video of the demo on Instagram.